Howe found fossils at the Harbor Freeway construction site near his house on 113th Street near Imperial Highway; the State of California later condemned his property for construction of the Century Freeway (Howe, 1977a). It is not clear whether the photographs in this series are from Howe’s find or from another excavation. 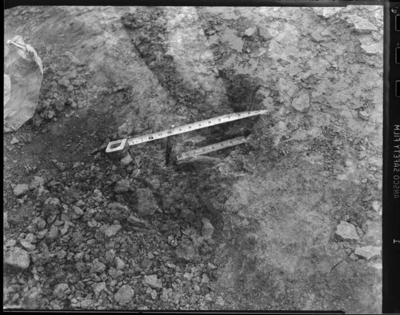 Photographs of Pleistocene bones (identification from notation on enclosure of (ASA001-82); view of the freeway dig between 112th and 113th streets in Los Angeles; sandspike picture made for Chuck Williams that Howe (n.d.) cross-indexed under the entry “Geological Interest” (ASA001-75, undated).